The lovely paradox we have been discussing the past few days of "buy the rumor, sell the news" has been getting thrown around the media, saying that this was the sole purpose for the big sell off we received yesterday. Come on...Sure there was indeed some of that factored in, since much of the buying on Friday and Monday were due to the "rumors" of the stimulus and new bank plan. However, Geithner also went up and disappointed Americans with his lack of answers for the direction the Treasury plans to head in these coming months. I believe Americans are slowly beginning to realize that there is a lot more talk with these politicians than walk. It is a very interesting week we have on our hands. After these plans shake out, there is really not much left for the government to unfold. I believe it is after the failure of this next attempt (my personal thoughts, obviously), that we will most likely see a market crash and a new bottom set. Investors are getting more desperate and losing more money, and it is fear that usually leads to the mass selling of a crash. As for now, it seems that stimulus hopes was able to keep the market green for today, but once again, we will see how long that green can maintain. We saw the Dow stay below 8000 two days in a row, which has not happened in a while and we’re heading into retail sales announcements for tomorrow, which could be pretty bad. Strangely enough, there has actually been a reduction in shorting the retailers going into the announcement tomorrow. It seems as if some people feel that they are low enough and don’t want to gamble with them anymore. Shares short in Wal-Mart (WMT) were down 21% to 40.3 million shares. The short interest in Target (TGT) lowered 15% to 39.1 million. Shares short in Home Depot (HD) were also off 8% to 59.8 million. In addition, the short interest in Johnson & Johnson (JNJ) fell 24% to 25.6 million and shares short in P&G (PG) dropped 17% to 30.3 million. Shares short in Coke (KO) lowered 20% to 20.5 million. The short play on financials was a mixed one. 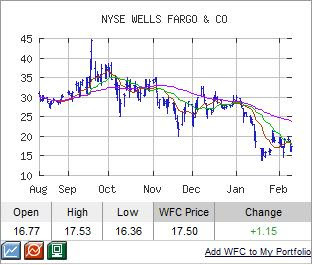 Short shares for Wells Fargo (WFC), were off 11% to 111.7 million. However, the short interest in Citigroup (C) was up 11% to 181 million. GE’s (GE) short interest were higher 17% to 168 million, as it has had increasing concerns. Below is the market trend analysis on WFC (get your own symbol analyzed for free, all you need is a name and email, Click Here). So indeed it does seem that there was some money moved out of the short side for the time being, but this does not affect my desire to remain mostly short right now. As I did not make many moves today and I still remain mostly in cash and in shorts, I am still waiting for the time that looks good to move in more. I think retail numbers have the potential to be disastrous. If by chance this number does go overlooked, thanks to more bailout fluff, I would expect it to catch up with us much like unemployment did. So, if we stay green tomorrow, shorts here I come. The government reached an agreement on price for the stimulus at $789 billion. They expect this powerhouse package to create up to 3.5 million jobs over the next 2 years. When doing the numbers, that means that for every position, it averages to be $223,000 per job. Sure, this number is to be over a period of time, but I think there are a lot of Americans who are willing to work for less than $60,000, let alone $223,000. Also, the government plans to have their plan of new “transparency” with the banks. Beginning next week, the top 20 financial institutions will be submitting a monthly TARP form, hoping to shine light of how much money they are receiving and where the money is going. I know they think of this as a transparency play, but this can also be a bad move by the government. I don’t know if the public is ready to handle some of numbers these banks are going to throw out. It could just make matters worse for banks and lower the consumer’s confidence. So we’ll see how that goes. Below is an example of the form they will be using. So, there still seems to be more uncertainty out there. The markets are still very vulnerable to violent movements either way. The day panned out much the way I expected it to, however, I did think financials got a bit more love than was due to them, and I was bummed to see SRS end in the red after the strong start this morning. That is slowly becoming a trend for SRS… Buy before close, sell in the morning. So tomorrow will be interesting. I plan to get into more shorts, whether it is red or green, pending some new announcement.
. Find me on chat tonight and tomorrow, Happy Trading. Can you forsee any movement for the next week? I don't see how there'll be anymore big swings since all the news are in, and with such little fuel until options expire next week. Though it seems there have been tons of calls compared to puts. I think that after the options expire we're going to see triple digits of red bleeding all over the place. Once again great post. I'm not a bear nor a bull, though more bear than bull but just like to be on the right side of the fence. gdx broke through 200dma after several attempts in the last couple of weeks, and closed solidly above the 200dma. i'm hoping gdx will stay above the 200dma again tomorrow, which i will take as a very bullish sign. if that happens, i think 40 is possible over the next couple of weeks. gold: gold broke through resistance at 925 and closed solidly above around 940. again, i'm hoping it remains strong above 925 in the next couple of days, which i also believe would be very bullish. 1000 could be right around the corner. obviously some major negative sentiment still lingering for investors... Big victory for Bears (so Far) to have the market down, with good retail news, which I believe the numbers were fudged anyways. hi. i'm at a computer where i can't access your chatroom. just wondering if you saw the possibility for a rally for the rest of today, and especially today. the S&P and dow are climbing above their supports of 820 and 7800. risky hedge on fas? sorry i meant especially tomorrow!